Vince Cable said Hitachi Rail Europe’s ceremony on Aycliffe Business Park represented a “good day for Newton Aycliffe”. The Business Secretary visited Newton Aycliffe on Friday to celebrate the beginning of construction of Hitachi’s £82m facility. Darlington firm Shepherd Construction was unveiled as the lead contractor for the state-of-the-art plant, which will take two years to build and create 150 jobs in its creation. “This is a big day,” said Mr Cable. “It’s a good day for Newton Aycliffe, obviously, and Durham. “But actually for the country as a whole, it’s a really big step forward in the rail revolution which is taking place in the UK. “We’ve historically thought of rail as something in decline. I grew up in York, where the carriageworks closed down. “But we now have a massive investment taking place, and on the back of it the growth of a major industry. “Out of this factory there’ll be 700 jobs and a rail supply chain as well as the building jobs. 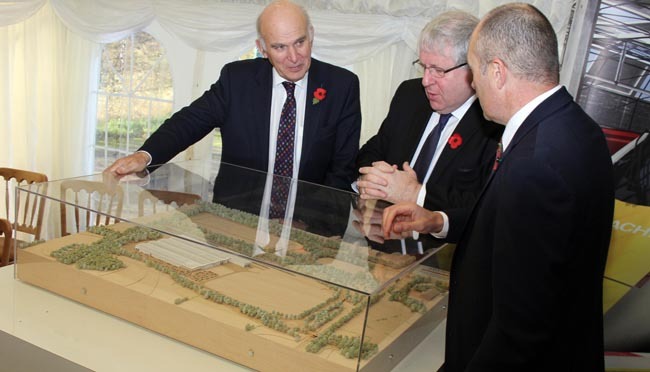 Mr Cable told guests the Hitachi factory, which was first given the green light when the Government rubber-stamped a £4.5bn Intercity Express Programme (IEP) contract to make 596 train carriages, is the result of a Government-business partnership. The Department for Business, Innovation and Skills has invested £4m, under the Grant for Business Investment scheme. Mr Cable said: “As we’re all painfully aware in local and national Government, there isn’t a great deal of money to splash around, but we try to match private investment with modest pump-priming. Hitachi announced a new £1.2bn deal to build 270 carriages as the second phase of the IEP, topping up the original contract, which will take manufacturing at its factory up to 2020. Mr Cable went on: “I see this as very much part of what we call the industrial strategy. “Business and government working together on a partnership basis, and thinking long-term, getting out of this very narrow, political cycle, never doing anything at more than five years at a time and thinking a generation ahead. “Patrick (McLoughlin) and I are sitting down with the rail industry, we’ve brought this very fragmented rail industry together, thinking about long-term training requirements. “Rail Academies are now being set up to train the next generation of people in the industry. “We’re beginning to get some really good, long-term strategic thinking going on, and the key to all this in the long-term is HS2, big national projects, potentially enormous benefits for the country and particularly the North of England, and it has to be seen through as a big national project.